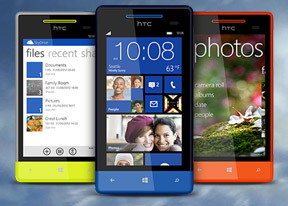 The HTC Windows Phone 8 has quad-band GSM/GPRS/EDGE support and dual-band 3G with HSPA. Local connectivity is covered by dual-band Wi-Fi b/g/n with stereo Bluetooth 3.1. Bluetooth is no longer limited as to what it can do - there's file transfer support now. There is Mass Storage mode for the internal phone storage or from the SD card, and you can upload files without needing to install any software. There is no requirement as to where you put your files (specific folders, etc.). If the phone has the appropriate app to handle a file, you'll have access to it. The phone knows music and video, as well as pictures and documents. But if you have a ZIP or a RAR file, you won't be able to attach it to emails, because there is no file manager and there is no app to recognize this file and list it in the phone. In addition to your phone storage, you also get 7GB of SkyDrive cloud space. Oddly, the SkyDrive app does not come preinstalled, meaning that you'll have to download it from the marketplace to take advantage of the free cloud storage. The 8S also come with the Wallet app, which lets you store credit card information for in-app payments. You can use Wallet to register a credit card for payment in the Windows Store or music store, as well as register digital coupons, memberships and loyalty cards. Unfortunately, since the 8S doesn't have an NFC antenna you can't use NFC to make payments with registered credit cards, but all the other Wallet functionality is still there. The Internet Explorer on Widows Phone 8 got some big time improvements under the hood, but has for the large part kept its old looks. The HTC Windows Phone 8S has a big enough screen for comfortable browsing, but the pixel density is average, so text can get fuzzy at low zoom levels. As usual, the URL bar is always visible at the bottom of the screen (but the status bar at the top of the screen auto-hides, so you don't actually lose any screen real estate) and next to it is the refresh button. The URL bar also serves as a search bar - by default, anything you type that doesn't resolve to an URL will be sent over to the Bing app. You can also pick Google as a search provider, which will open the Google search results page in the browser instead. You can, of course, bring up the extended settings, which offer a great deal of options - tabbed browsing, recent history, favorites, share options, pin to Start, find on page and settings. The settings menu offers the usual options like location, allow cookies, delete browsing history and it prompts choosing a global preference for mobile or desktop site versions. The Share option is interesting in that you can not only send the page address in a message, but you can share it with your Xbox (if you have it set up). This way you can easily transfer a page from your phone to your TV and continue browsing there. And finally, you can open more than six tabs simultaneously, eight or ten worked just fine (WP7.x used to have a restriction on the number of tabs). Browser benchmarks for the Windows Phone 8S were not as good as we've seen on other WP8 devices, but that's to be expected as not even the dual-core Krait can compensate for the measly 512 MB of RAM. By the way, Windows Phone 8 has built-in mobile data management tools called Data Sense. Its purpose is twofold - it tracks how much data each app has used and can even help you save data by compressing web pages and images before they are sent to the browser (similar to Opera's Turbo). Data Sense depends on carrier support and didn't work for us (not even tracking data usage). The looking glass button on the Windows Phone 8S brings you to the new Bing search app. At first glance, it's the same app overall - you type in a query and you get search results from the web and there's a pretty background photo with several translucent squares you can tap to learn interesting facts about the subject. Bing offers more than just web results though - for example, searching for "travel" will offer a travel tool app. This feature is called App connect. There are three search features you can quickly reach from the default Bing screen. The first one is Local Scout, which lets you search for various points of interest around you. There's the camera scanner too, which can snap a photo of text, run OCR and translate it into another language - this is the so-called Bing Vision camera lens. The third one is the song recognition feature that gives you track and artist name and takes you to the music store so you can buy the track. Bing also tries to be a bit of a homepage too - you can swipe to the left to browse top videos, locally playing movies and top headlines.